Whether you’re looking for functional or aesthetic truck accessories (or maybe a bit of both), check out Cap Connection for anything your truck needs. We carry tons of different accessories from manufacturers like LUND, TSI, Putco, and Anzo USA. Visit our store for a full-line of accessories from a wide range of manufacturers in all price ranges for your vehicle. LUND manufactures tons of high-quality accessories and parts for trucks including floor mats and liners, hitch carriers, vent visors, loading ramps, light covers, and more! Stop in at Cap Connection to see our full stock of LUND truck accessories. TSI manufactures a wide variety of drink holders and seat consoles for trucks. These drink holders and consoles come in many different colors, materials, and sizes. We will help you select the best style and size that fits your vehicle. 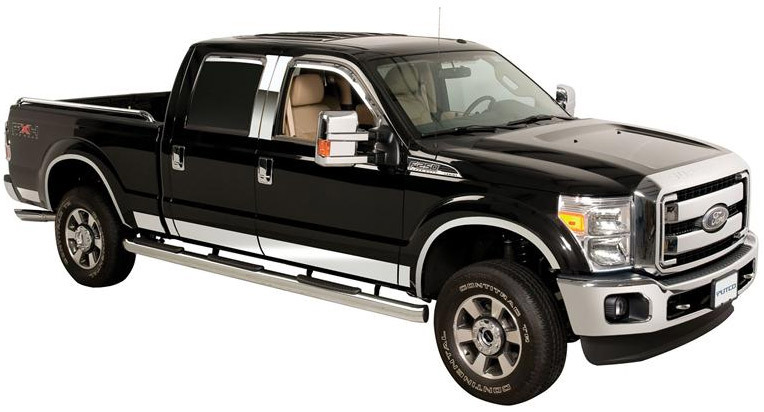 Spruce up your truck with sleek chrome accessories from Putco. We have chrome taillights, grille accessories, mirrors, handles, and head lamp covers available. Our Putco accessories are built to last through years of harsh Wisconsin weather patterns and are easily installed. Lighting from Anzo USA gives your truck extra flair. We have LED taillights, headlights, brake lights, bumper lights, parking lights, and more! Contact Cap Connection or stop in today to see our full selection of truck accessories!